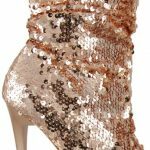 CHAMPAGNE KISSES features a pointed toe platform, stiletto heel, ruched details, all over sequin and a lightly padded insole for comfort. Light up the night in a stellar bootie that’s perfect for your holiday shindig! We love them paired with a floor sweeping maxi or take the plunge with a low neck line mini. Slip ‘em on and be the nights brightest star on the dance floor! Available in Black and Champagne.